Zenith Nutrition Whey Protein is an ideal nutritional supplement to attain lean muscular body. It contains whey protein isolate and concentrate with maximum protein. This is a ready source of protein for people looking to build up lean muscle tissue for a lean muscular body. Whey protein is power packed with 5.5 grams of BCAA (Branched Chain Amino Acids) and 11.7 grams of essential amino acids per serving. This is also an easily digestible source of protein. 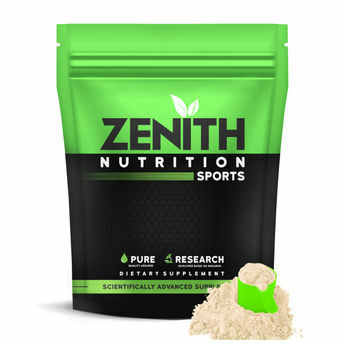 Zenith Whey Protein contains stevia, a natural sweetener with low calories making it ideal for calorie conscious people with high blood sugar level. The delicious French vanilla flavour makes this protein ideal for making smoothies or adding fruits and flavour of your choice. Explore the entire range of Lean available on Nykaa. Shop more Zenith Nutrition products here.You can browse through the complete world of Zenith Nutrition Lean .Alternatively, you can also find many more products from the Zenith Nutrition Whey Protein With Enzymes For Digestion French Vanilla range.